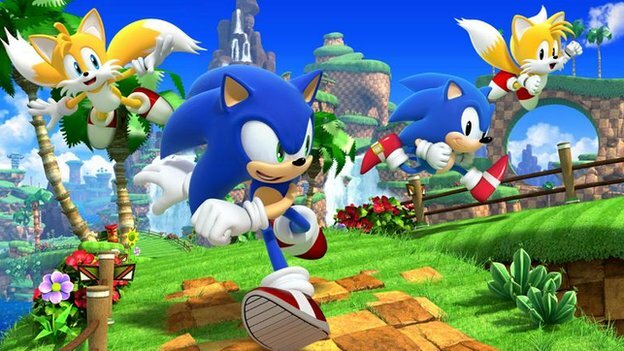 Anyone who’s ever wanted to own every Sonic game on Steam is in luck today: from now until 1 p.m. EST/6 p.m. BST tomorrow, every Sonic game on the service will be on sale for 75 percent off. For those of you who have never bought a Sonic game on the service before, Steam has an even better deal for you: a bundle that not only includes Dr. Robotnik’s Mean Bean Machine, but also gives you Sonic Generations and its Casino Nights DLC completely free. 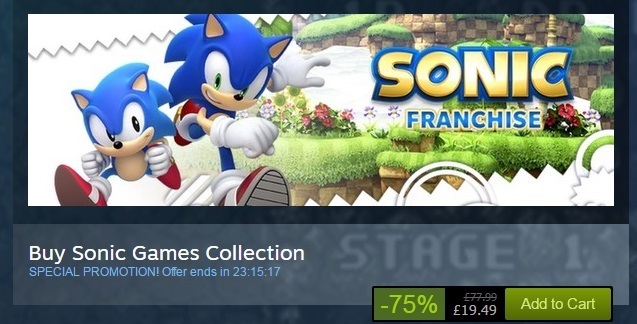 The Sonic Games Collection Steam bundle is currently going $28.24/£19.49. The Collection usually goes for $112.99/£77.99. You can check out the bundle and individual games here. 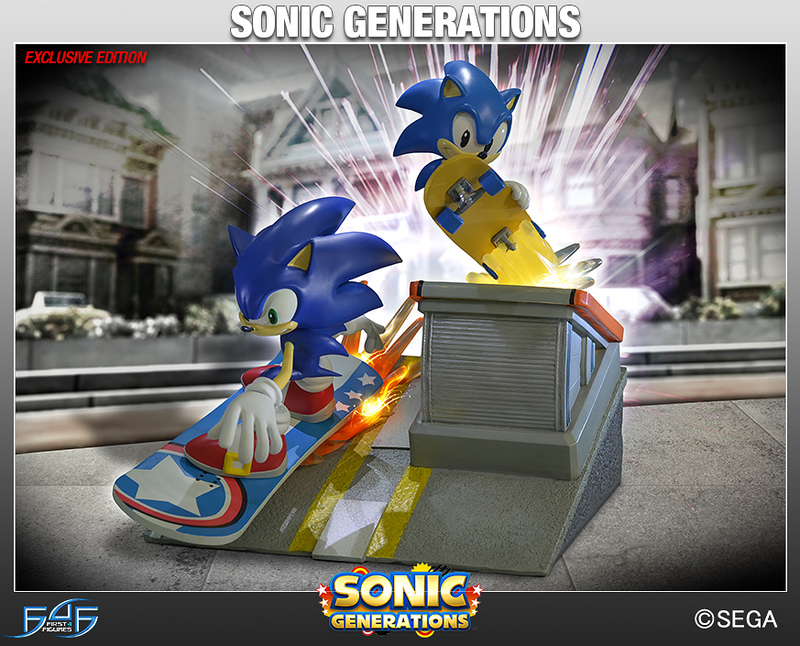 In the last few minutes, First 4 Figures released 5 images of their upcoming Sonic Generations Diorama piece originally revealed back in November on their Facebook page, and it looks to be nearing completion. First 4 Figures has confirmed that the statues are now complete and ready to be boxed up in preparation for shipping, and has been given a rough delivery schedule of mid-late August for delivery to collectors. Is yours in amongst all of this lot..? We’ll be sure to provide an in-depth look once we get ours! While we’ve had the Wii U for a full year now, the PS4 and X-Box One have made their debut. Since Sonic Lost World is part of the new generation of systems, I thought it would be a good time to reflect back on the best Sonic games of this past Generation. It was a hard list to make, not because there was a ton of great Sonic games to choose from but because there were so few to be brutally honest. Also, I have one rule to this list, no spinoffs. 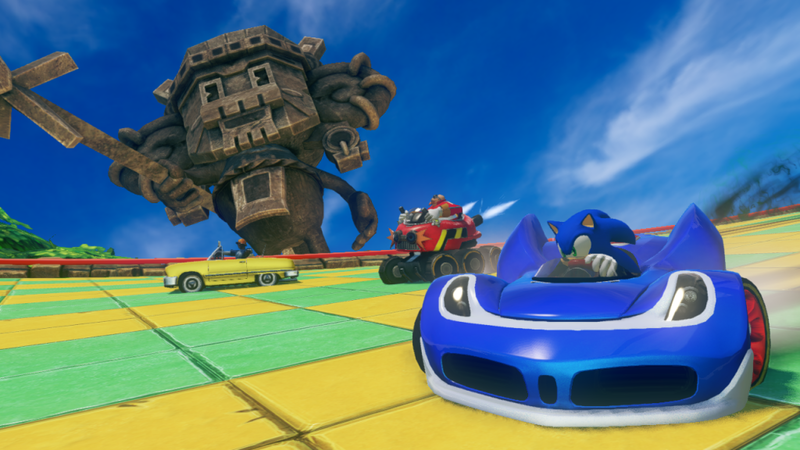 This means no Mario and Sonic or All-Stars Racing. (I should have been stricter with the staff pics and added no remakes or fan games but too little too late.) 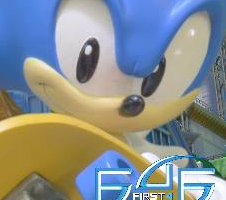 I wanted this to focus solely on Sonic. This means there’s a game in here that wouldn’t normally make any top five list. So prepare for the good, the great and the…..meh. NOTE: This is an opinionated article and everyone’s gonna have their favorites, so if your list is different from mine that’s fine but let’s make a huge fuss over it okay? Chances are if you wanted one of these you’ve already pre-ordered by now, but here you go anyway. First 4 Figures have opened pre-orders for their Sonic statue, however unlike previous editions, this is part of their new ‘diorama’ range. 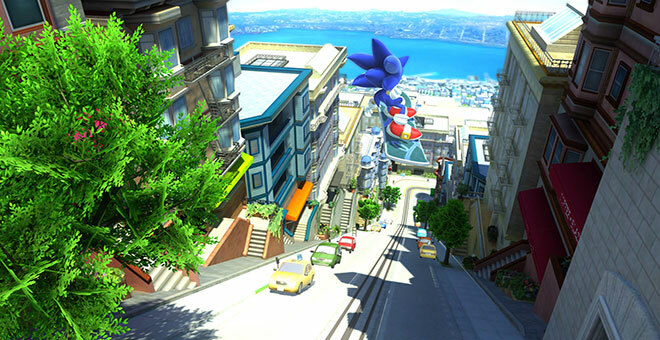 The scene depicts modern and classic Sonic skateboarding through the iconic City Escape stage as depicted in Sonic Generations. Whilst the statue may get a lot of you excited, some may end up being priced out of these as they’re VERY expensive! However, don’t forget those prices do not include shipping, for people living in the UK you’re looking at an extra $30 on top of that. Now for a limited time F4F have issued discount codes for each statue which takes $25 off the regular and $30 off the exclusive. Also if you are interested in pre-ordering, please be aware of what the statue will actually look like when you get it, the image at the top is very eye catching but it also has a lot of photoshopped effects that will not be on the final statue, this is a more true to life image of what it will look like. So, anyone here got a pre-order down? First 4 Figures have just announced the first in a new line of Sonic statues… and it’s incredible. 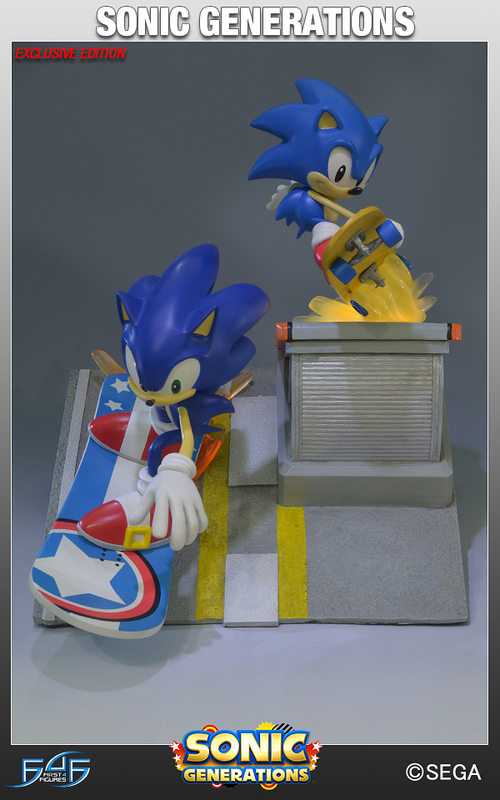 Part of a new Dioramas series of statues (yes that does imply there are more to come), the first in the series is ‘Sonic Generations City Escape’ and shows classic and Modern Sonic skateboarding through City Escape. No details on price just yet, however pre-orders open up on November 19th (next tuesday) for those who are interested. I hope your wallets are ready! 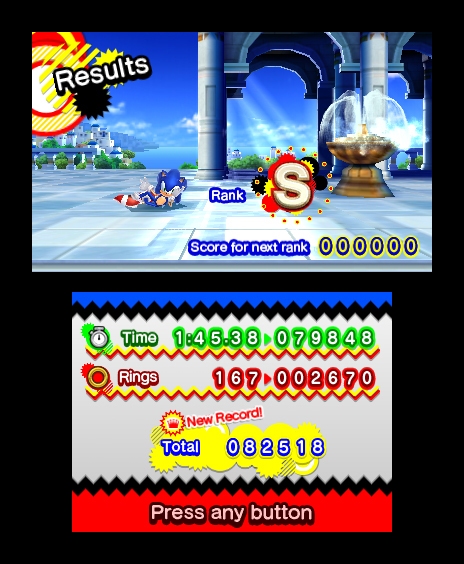 Following last week’s North American release, the Nintendo 3DS version of Sonic Generations is now available on the European Nintendo eShop. The digital edition of Sonic’s handheld 20th Anniversary game can be yours for £19.99. Just make sure you have plenty of space on your SD card. Thanks to SuperLink at the SSMB for the heads up! And now, for something completely different, here’s a quirky yet pretty cool mash-up TailsChannel put together not too long ago! 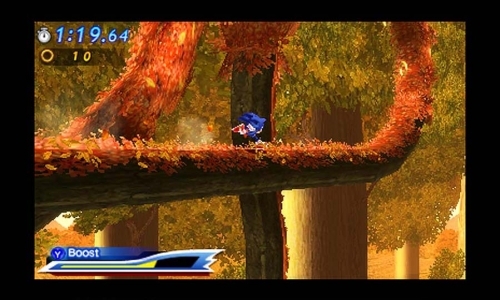 When Sonic Generations was formally announced by SEGA through a trailer showcasing Sonics classic and modern in action, many were quick to discover that the track used in the anniversary title’s first preview was Kele’s TENDERONI. With the trailer to Sonic Lost World gone online via a pre-E3 Nintendo Direct, it was soon pointed out that the tune accompanying the video was none other than Benny Banasi and Gary Go’s Cinema. I don’t think I have to tell you much else about what we’re showing off for Mash-Up Monday! Don’t forget to send your mash-up tips over via vizardjeffhog@sonicstadium.org! 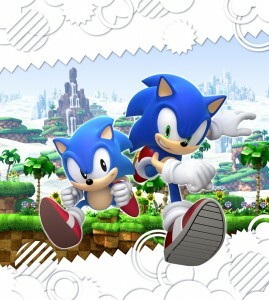 Sonic Generations 3DS Available via NA Nintendo eShop! Now you can take your blue hedgehogs on the go… on the go! Sonic Generations 3DS is now up for grabs on the digital market! North American 3DS owners can purchase the handheld edition of the 20th anniversary title for $29.99 via the Nintendo eShop, as announced via SEGA’s Twitter earlier today. The Blue Adventure version features an entirely different set of stages and bosses, save for Green Hill and the Rival bosses, and an online multiplayer mode compared to its White Spacetime counterpart, so to those who’ve been on the fence on picking up Gen3DS should be pleased to know that they can now pick it up from the comfort of their living room! If you plan on going digital with your games, make sure you’ve got a sizeable SD memory card! Combining Tomoya Ohtani’s classicized take on Rooftop Run from Sonic Generations with Zedd and Foxes’s Clarity, XlovesMiku presents a Rooftop Clarity – a rather unique combination what with the bittersweet lyrics playing over a jaunty tune! Perhaps, to those who tragically missed the SoS waves, maybe this Mash-Up Monday could be your remedy? …and I am not sorry for that pun. No refunds. Got a mash-up of your own you’d want featured on TSS? Or have you found one that you believe deserves the spotlight? If your answer is yes to either question, send your submissions or findings our way via vizardjeffhog@sonicstadium.org. Soundcloud, and Bandcamp submissions cannot be accepted at this point in time. Attached files will be ignored. 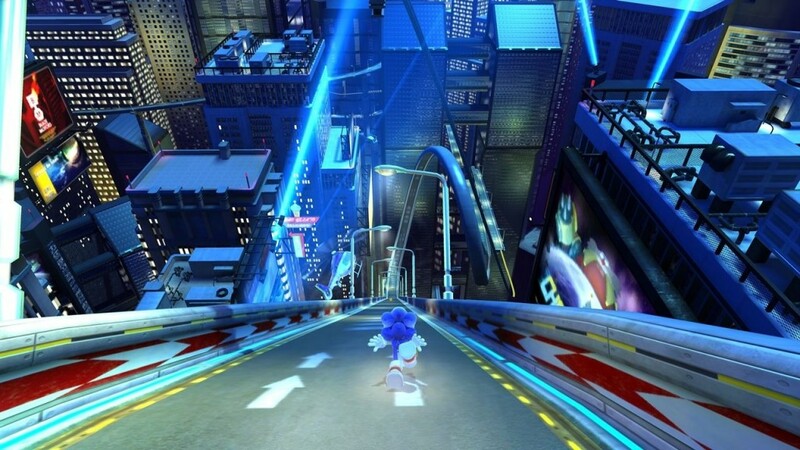 Rooftop run is one of our favourite levels in both Unleashed and Generations. 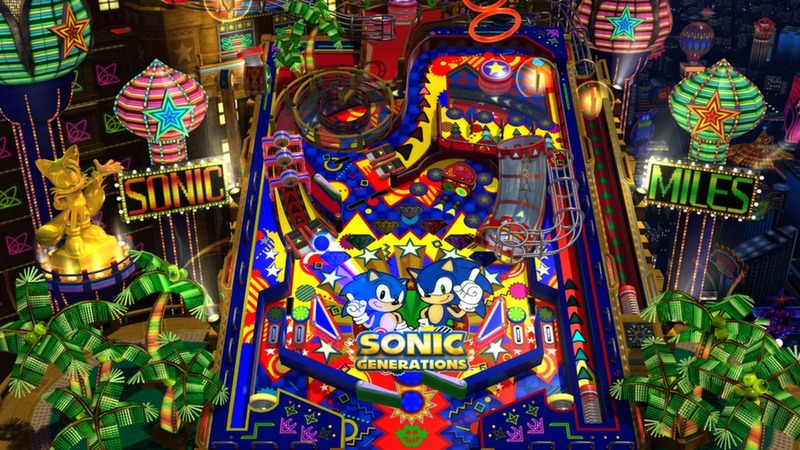 So when we had to pick a level to challenge the staff at The Sonic Show with, it was obvious what we were going to do. For the last seven days, The Sonic Show has been going Let’s Play mad with a new LP every day. To round the week off the only solution was to get four of the staff involved in a mad cap race to the finish to see who is the ultimate Rooftop Run…ner? Sonic Generations in one minute, as told by the folks at LORE! This is about as “long story short” as it gets! UPDATE: The game is up on the PS Store and actually costs £14.99. 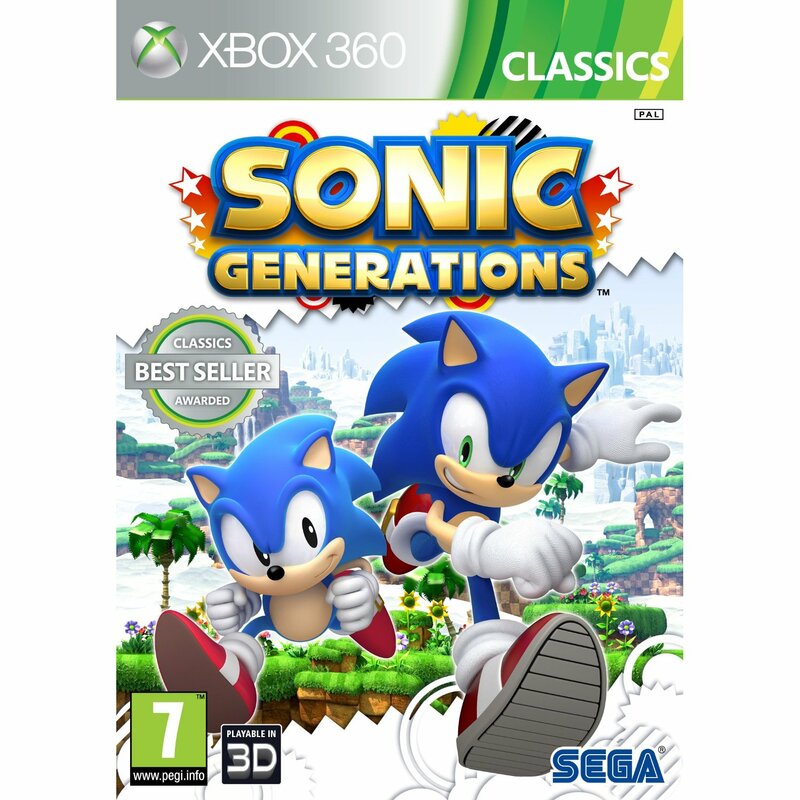 SCEE has revealed a list of the first budget PS3 Essentials titles that will be released for download from the EU PS Store later today, and Sonic Generations is one of them. 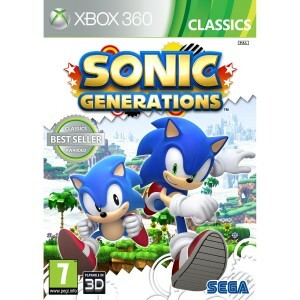 Sonic’s 20th Anniversary game will be available at the cheap price of £15.99.00/€19.99/AU$24.95. Sonic Unleashed and SEGA Mega Drive Ultimate Collection have also been announced for the PS3 Essentials range, but it appears they will be coming at a later date. Gamers who prefer physical media will also be able to pick up PS3 Essentials games in stores.